Have you ever wondered why the elite hate Donald Trump so much? There have certainly been many politicians throughout the years that have been disliked, but with Trump there is a hatred that is so intense that it almost seems tangible at times. During the campaign, they went to extraordinary lengths to destroy him, but it didn’t work. And now that he is president, the attacks against him have been absolutely relentless. So why is there so much animosity toward Trump? Is it just because he is not a member of their club? The truth, of course, is that it runs much deeper than that. Ultimately, the elite hate Trump because he is opposed to their demonic one world agenda. Many among the elite are referred to as “globalists” because their eventual goal is to unite the whole world under a single planetary system. These globalists truly believe that they know better than all the rest of us, and they want to impose their way of doing things on every man, woman and child on the entire planet. So they get really angry when Donald Trump talks of “building a wall” or establishing a travel ban from certain countries because they eventually want a world without any borders at all. And they get really angry when Donald Trump says that he wants to pull the United States out of international trade deals, because the elite were using those international trade deals to slowly integrate all nations into a single one world economy. And they really don’t like when Donald Trump criticizes Islam, because Islam is going to be a key component of the one world religion that they plan to establish. Until recently, you didn’t hear people being referred to as “globalist” very often. But in a time of rising nationalism, those who see the upside of globalism have become a distinct — and often embattled — tribe. Last week, the globalists had a big family reunion in New York. The gathering was focused on the United Nations General Assembly, but a growing array of side conferences and summits and dinners also attracted concerned internationalists of every stripe: humanitarians, leaders of nongovernmental organizations, donors, investors, app peddlers, celebrities. As you can see, even the New York Times uses the term “globalists” to describe these elitists. At one time you would have been considered a “conspiracy theorist” is you spoke of “globalists”, but at this point the elite are not even trying to put up a facade any longer. Trump opposes globalism. Hillary thrives on it. Globalism is far more than “geographical” or “eliminating national borders and boundaries.” It is spiritual and demonic at its core. Few—very few—understand this. This is quite likely one of the main reasons why Trump is hated. Do your homework on this one. Think “principalities and powers.” Serious. Extremely serious. The reason why the threat of globalism is so serious is because if a single global system is ever established there will be no escape from it. Just think about it – where could you go to escape a government that literally rules the entire world? These globalists are completely convinced that if they could just get control of everyone and everything that they could establish some sort of environmentally-friendly socialist utopia where war and poverty are eradicated. But in order to do that, they would need to be in a position to micro-manage the lives of every single person on the planet. In their minds it would not be tyranny, but for those of us that love freedom that is precisely what it would be. George Mason University Law School Professor and author of the 2004 book The Case for Sovereignty: Why The World Should Welcome American Independence Jeremy Rabkin argues that globalism fundamentally stands at odds with democratic forms of government. “It’s basically saying ‘We are going to organize the world in a way that establishes an artificial consensus.’ It’s not enough to say it’s undemocratic. It’s threatening; it’s almost demonic. It is a world organized independently of people’s fundamental religious convictions,” Rabkin said. I think that when Rabkin chose the word “demonic” that he was right on point. The global elite have already had a tremendous amount of success in promoting values, systems and laws that are “anti-Christian” around the globe. The globalists control the mainstream media, they control Hollywood, they control our education system and they control most of our politicians. They thought that they were almost ready to move into the final stages of their agenda, but then Donald Trump happened. 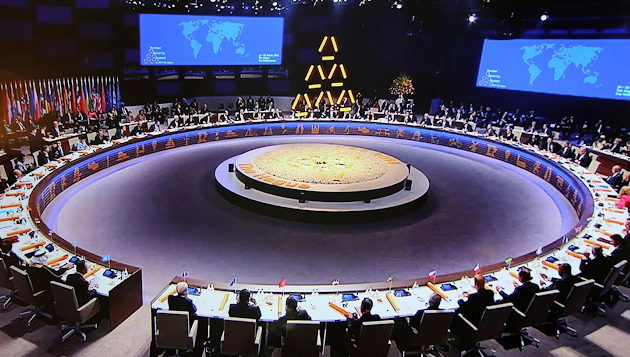 For the moment, the momentum toward a one world system has been stopped cold. But that doesn’t mean that the globalists will stop trying. Just because Trump won the election does not mean that they are going to roll over and die. The elite are going to use all of the resources at their disposal to try to destroy Trump, even if that means creating a tremendous amount of chaos. If you study the globalists, you will quickly discover that one of their favorite tactics is to create order out of chaos. So in the months ahead I think that it is quite likely that we may see quite a bit of chaos as the globalists attempt to get their program back on track. But if we understand what they are doing, we will be able to see through their games. So let’s keep shining a light on these globalists, because they always prefer to operate in the darkness.